GIVEAWAY~ English Provender Co Condiment Gift bag . I am a big fan of The English Provender Co, they make the most mouth watering selection of condiments . Some of the flavours available in their chutneys are Apples, Pear and Fig Chutney, Damson and Port, Caramelised red onion, Moroccan spice, Ploughman’s plum, Sweet tomato and chilli and lastly but not the least Hot chilli with red pepper. All seven chutneys each had a unique flavour, rich in taste and texture and are absolutely delicious. This is not surprising as all the chutneys are made with finest ingredients, starting right at home with the best quality vegetables, fruits and herbs, adding just the right blend of traditional spices, and then combining them to create simply delicious results. Recently they have a new addition to their family , the Bramley Apple Sauce with Calvados. 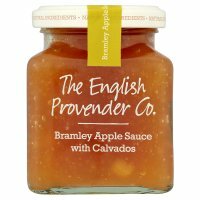 It is made using the finest Bramley apples with the addition of Calvados ( a type of brandy made from apples)and lemon juice which makes the sauce delicious and gives it a very distinct flavour. It the perfect accompaniment with Vegetarian and Non vegetarian dishes. This apple sauce was really different from any other I have tried it was rich and had a very natural deep colour, furthermore it is suitable for vegetarians and Vegans too. To check out the full product range you can click here. The English Provender also provides recipe ideas for their chutneys and condiments which you can check out here, It has an on line shop so you can order and sample the chutneys from the comfort of your own home. You too can sample these wonderful condiments ,The English Provender has kindly agreed to provide 2 free condiment gift bags to 2 visitors to this blog. You can check below to see how to be to be entered in the free giveaway. 1. This giveaway is open to all readers over 18 who have a UK mailing address. 2. The winner will be chosen via Raffle copter (which uses random.org) and announced on this page. 3. The winner will be contacted by e-mail, if they do not respond within a 48 hours another winner will be chosen. 4. There are 2 prizes of English Provender Condiment gift bags for 2 winner. By entering you are agreeing to share your address with simply.food to receive the prize. 5. I am running this competition in good faith on behalf of English Provender Co,Their decision is final and no correspondence will be entered into.They reserve the right to substitute a prize of similar value. 6. Instructions form part of the terms and conditions. 7. Entries using any software or automated process to make bulk entries will be disqualified. 8. No cheating. Please do follow the instructions. I will verify the winning entry and check that you have commented / tweeted / subscribed etc. Anyone who cheats will be disqualified. 9. There is one main way to enter and several ways to get bonus entries, including bonus daily entries. Follow the instructions in the form above. If you already like / follow comment in the raffle copter widget and let me know to get your entries. Many thanks to The English Provender Company and for providing a prizes for the giveaway. love spicy apricot with chilli chutney! sweet but hot - lovely! Thanks for the great giveaway! I love green chutney and make it myself using fresh coriander, mint, garlic, ginger, onion, green chillies, pistachio nuts and lemon juice! I enjoy mango chutney, too good just to leave for your curry! Years ago, at a friend's parents' house, his mum served us cheese and crackers and a homemade chutney. It was full of sultanas so I thought I wouldn't like it but it was slightly spicy, and delicious! I have no idea what it was called though! I like caramalised onion chutney with cheese and crackers. So hard to choose only one, but I remember a damson and walnut one my aunt made a few years ago which was really delicious. BTW - I have a giveaway for a vegetarian cookbook on my blog at the moment that you might be interested in. Thanks for giveaway! My favourite chutney is sweet tomato and chilli. Mango Chutney for me - love it! Red onion marmalade/chutney is versatile, but I also love any apple chutney with spices, perfect for a platter of cheese. caramelised red onion - simply delicious with anything! Any kind of apple chutney. Apple, pear and fig sounds delicious. Has to be mango chutney. Red tomato, pepper and chilli chutney - as made by my partner. Caramelised red onion chutney is my favourite! Mango , I love it !! WE made blackberry chutney last year - it was delicious! strawberries & champagne - scrummy! My favourite chutney is mango and lime which I first tasted in 2004 whilst on Honeymoon in Penang. But my favourite bought chutney in the UK is tomato and chilli. mango chutney is my fave, i love it!! Are the winners announced elsewhere on the blog? Just wondering who the lucky devil is. Thank you! @galina, winners are announced on the rafflecopter widget above. I don't even understand how I ended up right here, but I thought this put up was great. I think that what you said was very logical. However, consider this, suppose you were to write a killer headline? I mean, I don't wish to tell you how to run your blog, however what if you added something to possibly get folk's attention? I mean "GIVEAWAY~ English Provender Co Condiment Gift bag ." is kinda vanilla. You should look at Yahoo's front page and note how they create post titles to get people interested. You might add a related video or a picture or two to grab readers excited about everything've got to say. Hey! Do you know if they make any plugins to help with Search Engine Optimization? I'm trying to get my blog to rank for some targeted keywords but I'm not seeing very good results. I really loved the usual info a person provide on your guests? were you can use as backlinks to your site.